Developed to penetrate deep within the pores to clear existing blemishes and banish future breakouts, our healing and clarifying treatment oil is rich in powerful skin reparative agents. This potent cocktail of carefully selected acne-fighting botanical oils combats blackheads and blemishes, lightens and attenuates post-acne discoloration, and also regulates the skin’s natural oil production providing overall balanced hydration. The effective microbial and disinfectant properties of tamanu, neem, tea tree and lavender oils soothe inflammation and irritation, draw out embedded impurities, and rid the skin of acne-causing bacteria. Astringent and anti-inflammatory properties of ‘dry’ hazelnut and grapeseed oils encourage skin clarity and refinement, while the healing properties of antioxidant-rich borage and jojoba leave your complexion looking smooth, healthy, and glowing. The addition of pure clary sage, frankincense, and geranium essences instill this calming treatment oil with a fresh, therapeutic scent. Recommended for combination, oily, and/or blemish-prone skin. Formulated with 100% natural, hand-selected plant and flower extracts. Our oil blends are vegan, non-toxic, cruelty-free, and will never contain any synthetic fragrances, sulfates, parabens, or fillers. Suggested Usage: Shake gently before each use. Lightly massage 3-4 drops onto cleansed, slightly damp face and other affected areas. For optimal results, use morning and night. Precautions: For external use only. Avoid close contact with eyes. Store in a cool, dry place and out of direct sunlight. Amazing & so thankful to finally find the perfect fix for my skin as it has been difficult lately with breakouts since going through menopause. Imperfect skin oil by JJ has totally changed my skin to be so clear & beautiful! Love this oil!! Love this oil!! Not sure how I lived without it before! I’ve been using this oil for almost a year now and its completely changed my skin. I had horrible acne with really bad cystic breakouts and inflammation for years. I have tried almost everything, chemical peels, laser, every skincare line out there and my skin just seemed to get worse. I now keep things extremely simple and just use a norwex cloth and molecular water to cleanse my skin and follow up with this oil and I dont think my skin has ever been better. I am hooked! Can’t go a night without it! I’ve struggled with bad skin since I was 14 in varying degrees (I am now 35) and have literally tried it all. I am in the process of weaning my daughter and my normally oily and acne prone skin has become even more out of control and embarrassing over the past couple months, to the point even makeup makes my skin look even worse. I’ve literally spent thousands of dollars (not an exaggeration) on ALL the products for acne and my bathroom drawers are filled with products that are quarter/half used. I have never found anything that has calmed and cleared my skin SO quickly as your Imperfect face oil. I only started using it on Sunday night and I’m on day 3 and my skin is luminous and the painful cystic acne on my jawline has calmed and is now healing. My skin no longer feels tight and dehydrated or painful. LOVE this product!! I started with a small sample of the Classic oil which showed a small improvement fairly quickly. 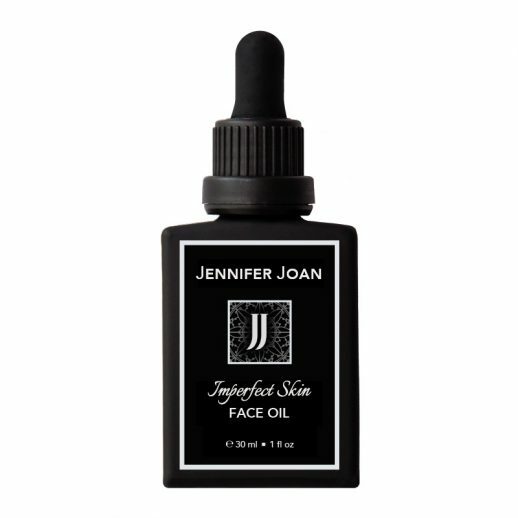 After talking with Jennifer about my skin and my history with trying out different products (oily and acne prone) she recommended I try the Imperfect skin face oil. I am very happy I gave it a try, I have been using it only 1 month and already 80% of my breakouts have disappeared. Thank you for the great suggestion and for your amazing products! I love this product and use it in conjunction with the Classic Oil. My hormonal, menopausal acne has met it’s match! Although I still get some acne, the Imperfect Skin helps clear it up faster. Also, it’s comforting to know you’re applying a natural product to your skin! Jen has been very informative and helpful along the way, awesome customer service and love supporting local, will continue to do so! Magic in a bottle. I’ve suffered from acne since I was a pre-teen (I’m now in my mid-thirties) and have never been able to get it under control, for any amount of time….until now. My skin is now soft, smooth and acne free. I’ll be a lifelong customer, for sure. I’ve always suffered from cystic acne; the bumps that are beneath the skin that turn bright red and hurt just to look at and seem to last forever. I currently have a little family of them on my chin and they’ve brought some friends, so I decided my “imperfect” skin was in need of some help. I ordered the Imperfect Face Oil and slathered some on my chin as soon as it arrived; by that evening one of the non-cystic pimples shed the scab that had formed and had lost some of it’s irritated redness. I reapplied the imperfect oil to my entire face prior to bed and woke up in the morning to my cystic acne visibly reduced in size, the redness had subsided and the pain had decreased; my face was no longer screaming at me. Honestly, if someone had told me with one day’s use of the Imperfect Oil I would notice a difference in these little beasts on my face I wouldn’t have believed them, but I also felt like I had nothing to lose. At the end of the day I gained a face that I’m not embarrassed to take out in public and the hopefulness that I will encounter less of my little friends in the future. I tried Imperfect face oil for the 1st time 3 wks ago. Results are amazing…soft skin, breakout free without an oily feel. I could feel & see a difference after 1 use overnight! I have combination oily acne prone skin- using Imperfect has completely changed that! 3 people commented within the 1st wk that my skin had a glow! Compliments I’ve never received!! Really is “miracle” in a bottle!!! It doesn’t disappoint! !